only if the JobCentre staff and the claimants were things like kettles. There's been a lot of Universal Credit news this week. And none of that news is good. First of all, the money. 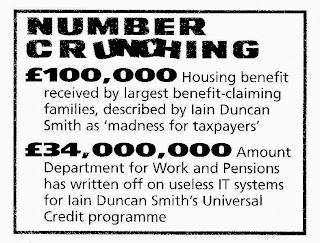 Never mind Private Eye's figure of £34 million being written off, we know that the write-off will be a nine-figure sum in the end and hope it won't be any bigger. That's bad news for the taxpayer – that's our money going up in smoke. Why bother to pay tax? It's bad news for the human beings who will remain caught in the benefits trap for years. 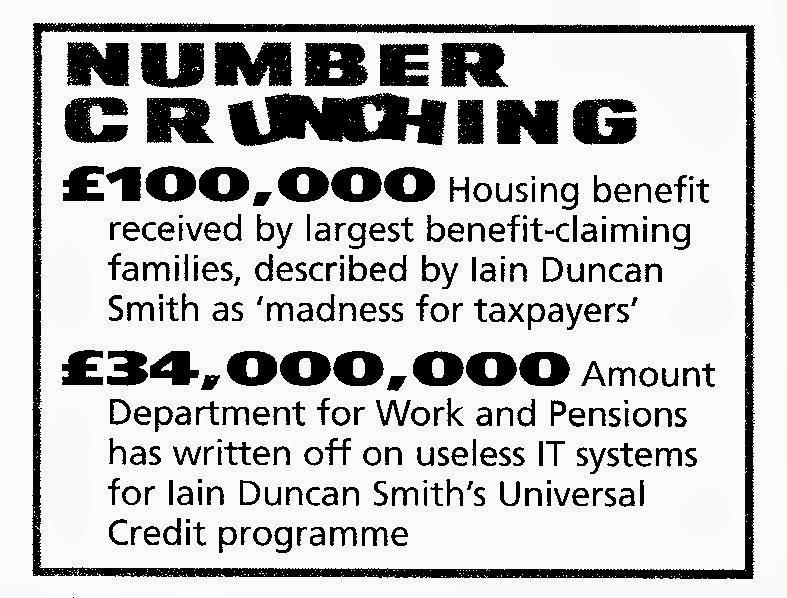 It's bad news for Iain Duncan Smith, Secretary of State for Work and Pensions. It's bad news for Robert Devereux, Permanent Secretary at the Department for Work and Pensions (DWP). And it's not good news for the contractors who have been paid a fortune. World-class professional systems integrators every one of them – Accenture (£125 million), IBM (£75 million), Hewlett-Packard (£58 million) and BT (£16 million) – their name is Mudd. There is one organisation it should have been good news for – the "hot-shot computer programmers from the Government Digital Service (GDS)", as Rachel Sylvester called them in the Times. But it isn't. Not even for them. Last seen in these parts, DWP had two options. Stick with the existing contractors and try to make the Universal Credit IT systems work. Or ditch them, and opt instead for the more web-based approach recommended by GDS, something more "agile" and more "digital by default". "As mentioned by DWP last week, we completed work on a digital strategic solution of the Universal Credit service on October 3rd. That included a proof of concept – tested with real users – and an outline of the operating model and any dependent technology required. With that delivered, we’re supporting DWP while they develop the digital skills needed to build and operate the full service." Thus ex-Guardian man Mike Bracken, writing on the Transformation blog the day before yesterday. He is the chief executive executive director of GDS, part of the Cabinet Office, and the senior responsible owner of the pan-government identity assurance programme. DWP's decision is thanks, but no thanks. They will continue with the existing contractors while re-writing the Universal Credit IT system without GDS's assistance. Once that's written, it will take over and the existing systems will be dispensed with. But the new system will not be digital by default. Hat tip: Tony Collins, as ever, Universal Credit to be partly online (but not entirely on-line). Special hat tip: Brian Wernham, Universal Credit project to abandon ‘digital-by-default’ – £303m spent, £65m of IT assets to show for it. That is the decision of Howard Shiplee, Director General for Universal Credit, overall manager of the project, following his success in getting all the Olympics 2012 buildings put up on time. Mr Shiplee was up in front of the Work and Pensions Select Committee on Monday where there was some badinage about the relationship between DWP and GDS/the Cabinet Office. As Tony Collins puts it: "... Stephen Lloyd, Liberal Democrat, ... asked if there is any truth in the suggestion that if the Cabinet Office doesn’t stop interfering Shiplee will quit". Mr Shiplee played that with a straight bat, of course, but why have DWP rejected digital-by-default? The answer given to the Committee was: "From a security point of view to have everything digital is not at this stage a sensible or appropriate solution". Mr Shiplee was talking about the need for claimants to prove who they are and to prove that their current circumstances make them eligible for Universal Credit. What he is saying is that GDS's digital-by-default can't offer that proof. And that, as others have pointed out, is a grenade with the pin pulled out. If it is accepted that digital-by-default – or more precisely, on-line identity assurance – cannot offer the proof required, then it's dead. RIP. And if that's a reason for DWP to avoid digital-by-default, it's a reason for every other department, too. Mr Shiplee holds out the possibility that on-line identity assurance could one day be available: "It will take some considerable time to get to a totally online system". But so what if it is one day available? Would it then be right to make Universal Credit digital by default? Go back two months to the Public Accounts Committee hearing. Take a look at Q155 and Mr Devereux's answer: "With regard to all those people who are currently out of work and are going to be supported by universal credit, I will want to see them in the jobcentre. I am trying to ensure that—in eyeballing my agents, in signing the claimant commitment and in understanding their obligations—there is going to be some human contact". Are those "agents" Mr Devereux refers to – the JobCentre staff who are being "eyeballed" by the benefits claimants – doing a valuable job? If you think the answer is no, then they are redundant, perhaps they can be replaced by computer systems and perhaps, 11 years after digital-by-default starts (GDS's estimate), 40,000 or more of those public servants can safely be laid off and perhaps that will save £1.7 billion a year (again, GDS's estimate). GDS accept that there are occasions when you need to meet people face-to-face. Particularly when you are doing requirements elicitation, i.e. trying to find out what the users need from a computerised system. Even GDS don't think that all communication can be on-line. You have to be there, in the room with the users, during the "discovery phase" of a project, as GDS call it, otherwise something important is lost. That is an article of the "agile" methodology that they profess. This is what we have christened before a "Class H" transaction, where "H" stands for "human", and we distinguished it from Class D (for "digital") transactions such as buying a book from Amazon, which can perfectly well be done digitally. If you think that working with benefits claimants, assessing them and trying to get them back into work, is a Class H transaction, then digital-by-default is not "a sensible or appropriate solution" even if on-line identity assurance is available, which, at the moment, it isn't. The contribution of the JobCentre staff can't be replicated by the artificial intelligence of a set of algorithms and neither can the requirements of the claimants. We have come across the phrase "the internet of things" before, please see Instrumenting the kettle. Digital-by-default would work for Universal Credit only if the JobCentre staff and the claimants were things like kettles. They're not. GDS's mission in the case of Universal Credit is inhuman. And if an understanding of that point comes out of this week's Universal Credit scandal then at least there'll have been some good news. It is much to do with flaws in human nature of "self interest".....DWP UC and now GDS describing themselves as “the best start up in London” are extreme examples!